Ireland's fly half Ian Madigan kicks a penalty during a quarter final match of the 2015 Rugby World Cup between Ireland and Argentina at the Millennium Stadium in Cardiff, south Wales, on October 18, 2015. CARDIFF, WALES - OCTOBER 18: Juan Imhoff of Argentina evades Dave Kearney of Ireland during the 2015 Rugby World Cup Quarter Final match between Ireland and Argentina at the Millennium Stadium on October 18, 2015 in Cardiff, United Kingdom. Ireland's scrum half Conor Murray kicks the ball during a quarter final match of the 2015 Rugby World Cup between Ireland and Argentina at the Millennium Stadium in Cardiff, south Wales, on October 18, 2015. Ireland's flanker Jordi Murphy breaks through Argentina's defence prior to Ireland's second try during a quarter final match of the 2015 Rugby World Cup between Ireland and Argentina at the Millennium Stadium in Cardiff, south Wales, on October 18, 2015. Ireland's flanker Jordi Murphy (L) scores his team's second try during a quarter final match of the 2015 Rugby World Cup between Ireland and Argentina at the Millennium Stadium in Cardiff, south Wales, on October 18, 2015. CARDIFF, WALES - OCTOBER 18: Referee Jerome Garces speaks with Jamie Heaslip of Ireland during the 2015 Rugby World Cup Quarter Final match between Ireland and Argentina at the Millennium Stadium on October 18, 2015 in Cardiff, United Kingdom. 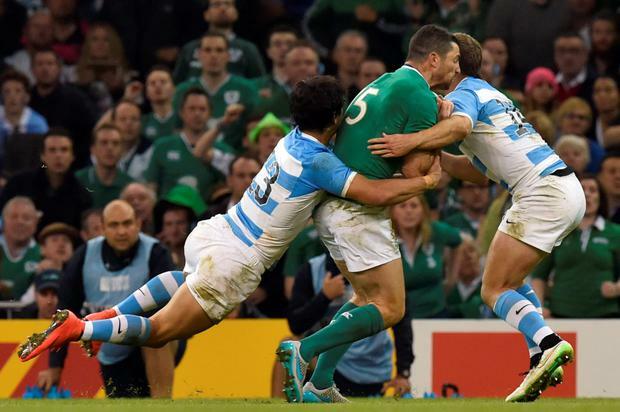 Ireland's flanker Jordi Murphy (L) breaks through Argentina's defence prior to Ireland's second try during a quarter final match of the 2015 Rugby World Cup between Ireland and Argentina at the Millennium Stadium in Cardiff, south Wales, on October 18, 2015. Ireland's flanker Jordi Murphy (L) celebrates with Ireland's centre Keith Earls (C) and Ireland's lock Devin Toner (R) after scoring his team's second try during a quarter final match of the 2015 Rugby World Cup between Ireland and Argentina at the Millennium Stadium in Cardiff, south Wales, on October 18, 2015. Ireland's wing Luke Fitzgerald (L) is tackled by Argentina's number 8 Leonardo Senatore during a quarter final match of the 2015 Rugby World Cup between Ireland and Argentina at the Millennium Stadium in Cardiff, south Wales, on October 18, 2015. Ireland's full-back Rob Kearney (L) and Argentina's wing Santiago Cordero jump for the ball during a quarter final match of the 2015 Rugby World Cup between Ireland and Argentina at the Millennium Stadium in Cardiff, south Wales, on October 18, 2015. CARDIFF, WALES - OCTOBER 18: Pablo Matera of Argentina catches a high ball under pressure Rob Kearney of Ireland during the 2015 Rugby World Cup Quarter Final match between Ireland and Argentina at the Millennium Stadium on October 18, 2015 in Cardiff, United Kingdom. Argentina's prop Ramiro Herrera reacts during a quarter final match of the 2015 Rugby World Cup between Ireland and Argentina at the Millennium Stadium in Cardiff, south Wales, on October 18, 2015. Argentina's centre Matias Moroni (L) reacts after scoring the first try during a quarter final match of the 2015 Rugby World Cup between Ireland and Argentina at the Millennium Stadium in Cardiff, south Wales, on October 18, 2015. CARDIFF, WALES - OCTOBER 18: Jamie Heaslip of Ireland reacts next to his team-mates during the 2015 Rugby World Cup Quarter Final match between Ireland and Argentina at the Millennium Stadium on October 18, 2015 in Cardiff, United Kingdom. Ireland's wing Luke Fitzgerald (C) reacts after scoring his team's first try during a quarter final match of the 2015 Rugby World Cup between Ireland and Argentina at the Millennium Stadium in Cardiff, south Wales, on October 18, 2015. A whole raft of Irish rugby fans were spared the rush to airline and hotel websites to scramble for the last seats to, and beds in, London next weekend. Never mind the telephone numbers that would have cost to cover the trip, it was a price they would gladly have paid. The target in this World Cup was a semifinal, which would have been against Australia in Twickenham next Sunday. What needed to be shelled out to get there, either in cash by the fans or blood and sweat by the players, wasn’t the issue. 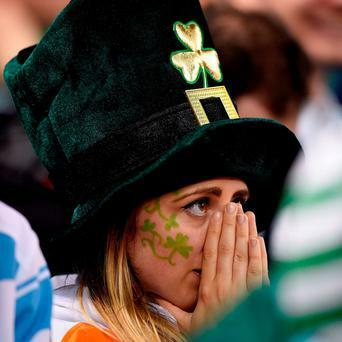 A dejected Ireland fan in the stands during the Rugby World Cup match at the Millennium Stadium, Cardiff. Ireland fans show support for their team in the stands during the Rugby World Cup match at the Millennium Stadium, Cardiff. Irish fans Patrick Kelly and Rory Flanigan from Dublin at a Paul O'Connell statue outside Paddy power's in Cardiff ahead of the Rugby World Cup Quarter final showdown Pic:Mark Condren 18.10.2015. Irish fans in Cardiff ahead of the Rugby World Cup Quarter final showdown Pic:Mark Condren 18.10.2015. That the fans got value for money here in the Millennium Stadium was inarguable. They made up the bulk of the 72,316 under the roof, and again they made a huge contribution. Their only complaint will have been that they paid in to an 80 minute gig and watched their team, back-to-back Six Nations champions, stuck in the starting blocks for the opening 20. It would be a surprise if some of those players, over the course of the coming week, don’t refer to that opening quarter as being like an out of body experience. Backboned by four years of competition in the Rugby Championship – a quality we don’t get in the Six Nations – the Pumas' progress has been terrific. And indeed so was the game. This World Cup has been blessed with some cracking contests, and this was better than most. Ireland's Jordi Murphy goes in to score his team's second try during the Rugby World Cup match at the Millennium Stadium, Cardiff. Argentina didn’t just play winning rugby but they did it with a style that was memorable. However, if you had expected them to be dealing with a lot of ball in the air, and a defence that put them under pressure they had been spared since playing New Zealand in the opening pool game last month, then that never materialised. It was hard to credit the space Ireland afforded the Pumas. When the blue shirts needed to be blitzed instead they were shepherded. The net effect was to give them a handy intro to the game, and by the time they had stopped to acknowledge this largesse the scoreboard read 17-0 in their favour. By then Ireland had also lost Tommy Bowe, stretchered off in a lot of pain after being twisted in a tackle. Matias Morini was over for the first score inside three minutes; then Juan Imhoff for the first of his two tries, on 10 minutes. When the almost impeccable man of the match Nicolas Sanchez knocked over a penalty on 17 minutes you wondered how or if Ireland would respond. The good news? Eh, they regained two of their own restarts. But ideally in rugby you only want to be running through that routine once: either to start the game or to start the second half. Luke Fitzgerald rewarded the crowd with a great finish on 26 minutes to open Ireland’s account, but late in the second quarter there was a sequence which, if you were looking for a break in the fog over the Ireland side, suggested visibility would be poor for a while yet. First Ireland got a scrum penalty against Marcos Ayerza which should have gone the other way. When Ian Madigan hit the post with his mishit Ireland got another break with Santiago Cordero losing the ball forward as he tried to run it out. So, scrum under the sticks, and when it leads to the first bit of continuity in or around the Argentine 22 the Pumas promptly steal it at the ruck. On the next two plays Keith Earls was choked, and then Cian Healy was penallised at a scrum. Nothing from all of that suggested Ireland could get some traction in the game. The only thing they could take from that first 40 was that the deficit was only 10 points. The stats said Ireland had marginally more ball and territory in that period and, remarkably, the same number of turnovers (8). It certainly didn’t feel that way, or maybe it was that the Pumas capacity to burgle Irish rucks were all impeccably timed. When Ireland started the second half by spilling the drop off you waited for fans to start looking for the exits. Then came a comeback that was near heart-stopping, and helped by tight head Ramiro Herrera being carded for a late hit on Keith Earls. A perfect lineout play put Fitzgerald through a hole and he offloaded to Jordi Murphy to score: 17-20. 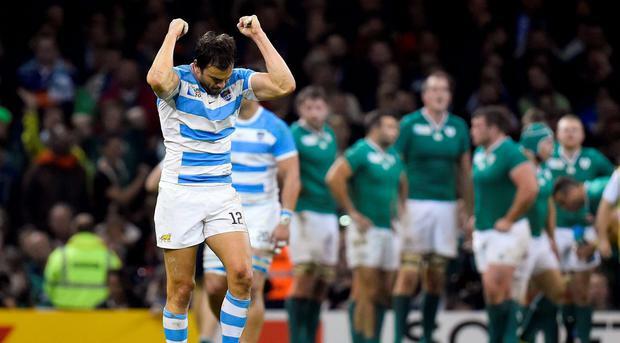 Significantly though the Argentines kept their heads at a key moment, because Ireland were on a big roll and the crowd were screaming for more. Sanchez kicked another penalty, and then came a huge moment in the game. Herrera was picked up for charging dangerously into a ruck, whereupon referee Jerome Garces reffed the bigger picture instead of the smaller one. When we heard him on the reflink say he needed to be careful – ie Garces, not the player – you knew what was coming. His job was to referee the incident, not its consequences. So Herrera stayed on the field when he should have walked. You wonder if Ireland could have put away a 14 man Puma side with 17 minutes left and a three points deficit – Madigan nailed the penalty against the prop – such was the quality of the Argentine game. Throughout their attack shape was very good, their recycling too, and they spot tackled very well when Ireland tried a few wraps in midfield. We’ll never know. A few minutes later Madigan missed a penalty that would have leveled the game 23-23 and that was to be the last score for the favourites. The Pumas knew they had ridden out the storm, and to their credit piled on a few more points for good measure. It was the third time for Ireland to lose to Argentina in a World Cup. To be beaten by a heap made it harder to take, but then that’s how it was in 2007. The patching up exercise for Joe Schmidt will start soon enough. Putting out a fit team against the Walalbies would have been an effort. One that he is now spared.